Kitchens are often the most expensive renovation in a home. Taking an unconventional approach can cut costs, conserve resources and still deliver an attractive, functional space. With no budget for a kitchen in my first house I cleaned up an old, grease-covered workbench from Lost Ark that became an all-in-one work space, breakfast bar and storage shelf. Visitors always admired it and it provided a really spacious, easy to use solution for a fraction of the cost of a modern kitchen. In this Northcote fitout by Recycled Lane, a battle-scarred industrial workbench also plays a leading role. 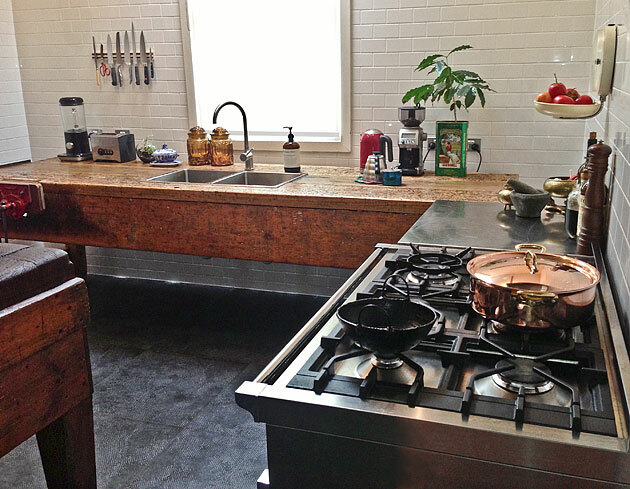 When Stuart and Marijke moved from St Andrews to Northcote several years ago they wanted to install a sustainable kitchen using reclaimed materials. The best option kitchen shops could offer was plantation timber, which still has a high transport/manufacturing footprint, and the quote was around $50,000. Unsure how to find what they wanted, Stuart suggested they look for a recycled industrial kitchen. 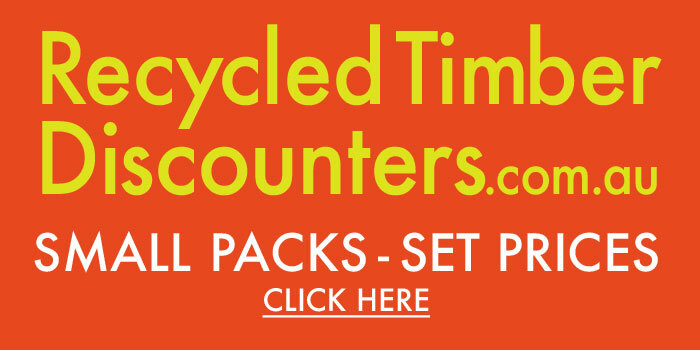 With that in mind, Marijke noticed the Recycled Lane shop in High Street and stepped inside to ask about commissioning recycled timber cupboard doors. While in the shop she wondered if the workbench on display could be modified to hold a sink. That chance meeting with craftsman Con Zois led to a creative collaboration that delivered exactly what they wanted. 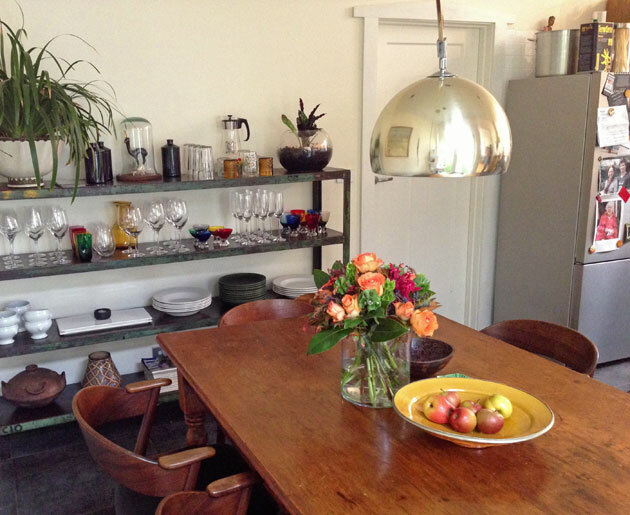 A low footprint, practical family kitchen with loads of character. 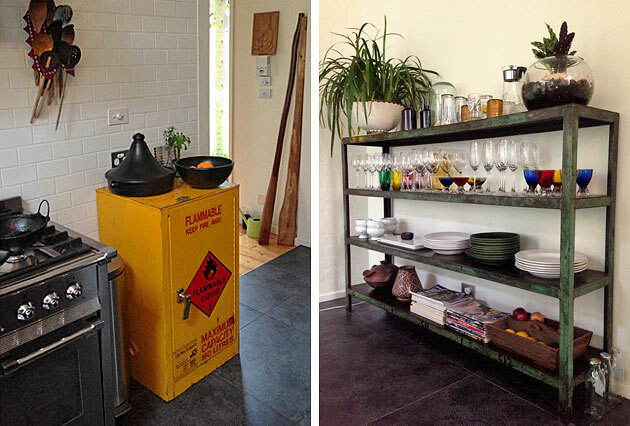 – A recycled records cabinet from Heidelberg Repatriation Hospital as an open pantry with plenty of storage. 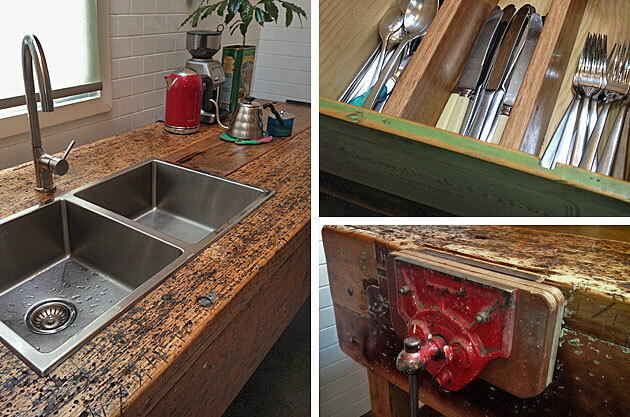 – A vintage workbench from a Deer Park ammunition factory, with a sink added by Recycled Lane. 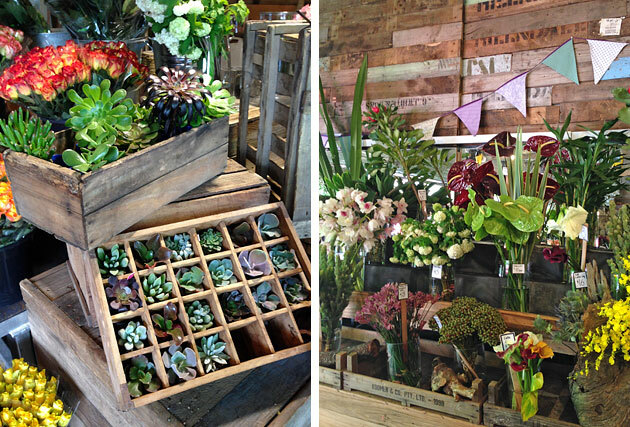 Have you noticed how all the vintage shops in Melbourne are stocking workbenches lately? 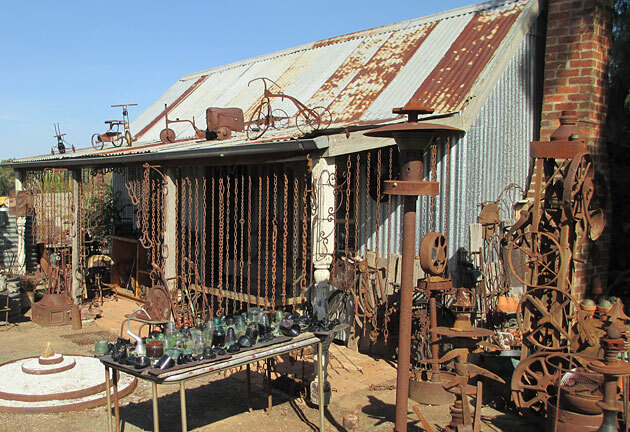 This humble fixture from old garages and workshops around Australia is in demand and you can see why. Heavy slabs of timber with decades of use develop a rough, lived-in surface that’s the exact opposite of glossy, modern finishes. Workbenches stand out, they look stunning, and they have a story to tell. This one couldn’t be pulled apart so it made the torturous journey down the side of the house and through the back door on the backs of several generous friends. Look at those massive hardwood slabs – I imagine they earned a stiff drink at the end of the day. – A butchers block island. 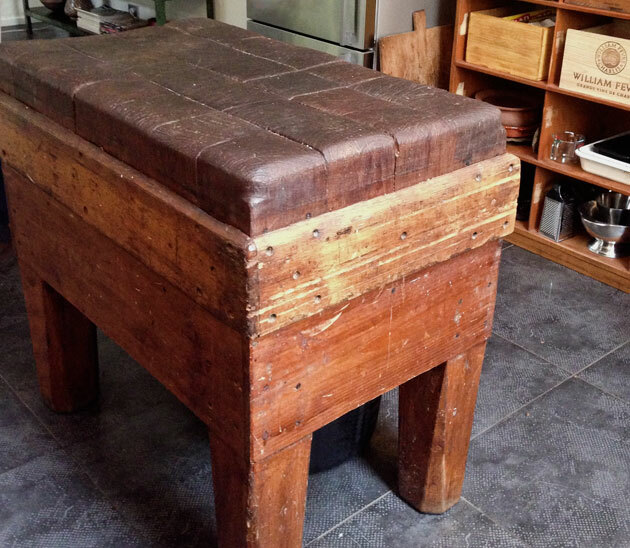 Marijke purchased the heavy-duty chopping block from their local butcher many years ago when it got too worn to satisfy health department regulations. 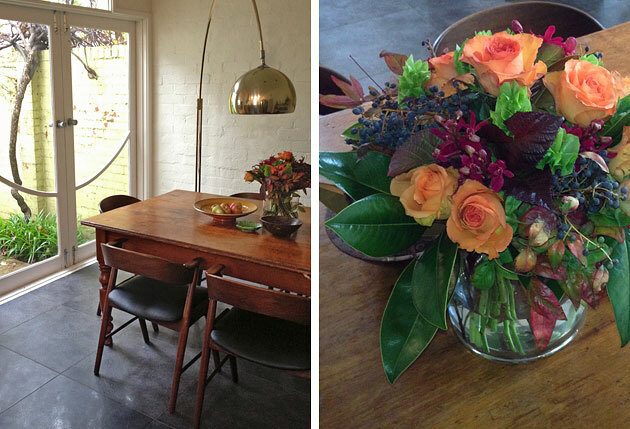 Its rustic patina compliments the workbench and it provides a sturdy centrepiece for the room. 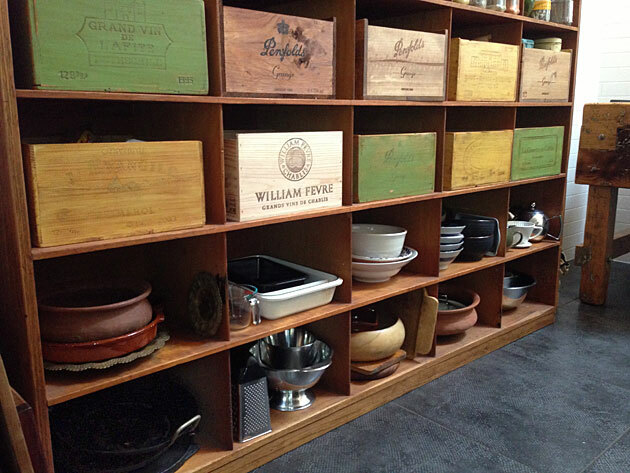 – An industrial metal shelving unit for glassware and crockery. – Clever storage. This is a kitchen without cupboards so how do they keep it neat? Marijke says she pared down unnecessary kitchen clutter to what they actually use, and they have a couple of hidden storage options for less glamorous necessities. 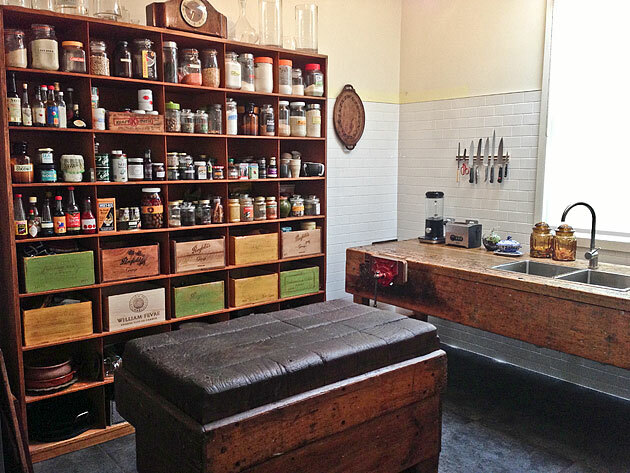 The workbench top incorporates two panels which slide open to reveal space for dish cloths and cleaning products; recycled wine boxes hide cutlery and kitchen utensils in the pantry; and the small ‘Flammable’ industrial cabinet holds assorted tupperware. I was impressed by this kitchen. I tend to jam stuff into cupboards without much thought so having everything on display would be a challenge, but I loved the feeling of simplicity and warmth. 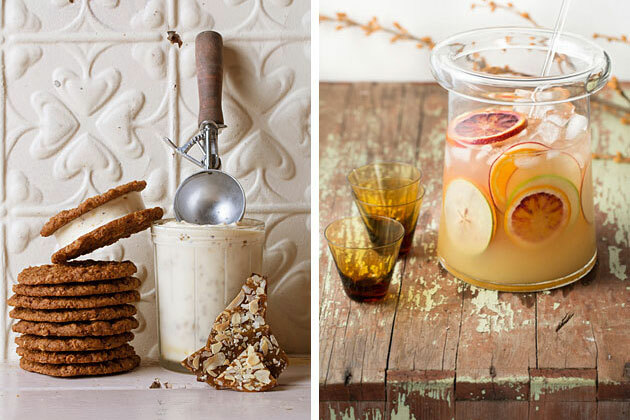 Cooking amongst these rustic timber pieces would be a genuine pleasure. Many thanks to Marijke and Stuart for sharing this project. Display-home aesthetics can be expensive, wasteful and boring. Viewing other solutions helps to broaden design parameters and encourage lateral thinking. Perhaps the best part of this renovation is you could take all the cool pieces with you when you move on!